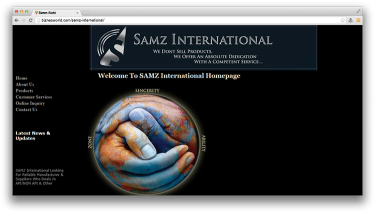 Description SAMZ INTERNATIONAL is a global company whose products touch the lives of people around the world every day. SAMZ INTERNATIONAL markets a wide range of API, Pharmaceutical Raw Materials and other chemicals. Address Suite No.422, 4th Floor Anum Blessing, Near duty Free Shop, Shahrah-e-Faisal, Karachi.